For something that has a camo skin, you can’t really miss this Aorus X5sv5. While it’s certain to turn heads, but how good is it at gaming? Specifications-wise, it looks the business. Featuring a 6th Generation Core i7 6700HQ and the gold standard GPU for laptops, the Nvidia GTX 980M, with 8GB GDDR5 alongside 16GB of DDR5 2133MHz RAM the Aorus is ready for anything. Of course, it needs this power to make use of the 4K IPS display. The resolution, at 3840 x 2160, means that even with this setup, the laptop isn’t going to be able to cope with all games at its highest default. But it’s not just games that can utilise the 4K screen, photoshop and video are well catered for by the tech specs on offer. The laptop features a 256GB M.2 SSD drive for fast booting and a few programs that can make use of the faster drive speed, alongside a 1TB 7200RPM hard drive to cope with the rest. Looking at the sides and back of the device, there are 2 x USB 3.0 on one side, alongside an HDMI 2.0 port and SD card slot. Power, USB3.0, LAN and VGA connections are on the rear. The left side houses mDP, a single USB-C port and the headphone and mic 3.5″ ports. It’s a well thought out system that means cables aren’t all crossing each other. The built in wireless is Wi-Fi ac, BT 4.0 and seems to provide a good signal coverage if using a decent router with the same settings. This isn’t a small device, being 390 x 272mm and 23 millimetres thick, but it’s not the largest, either. The weight is around 2.5 kilograms, so you won’t want to be lugging this around for too long, but part of this is to allow for a bigger battery, an issue we found in smaller laptops where battery life was very short. The camo design is certainly a head turner, especially in conjunction with the smooth angles and fan blade design on the sides, it just makes the Aorus look like it’s ready for business. The camo paint is added via a unique system that was previously used in the army, which means that it’s unlikely to cause any issues that you’d get with novelty wraps, this stuff is pretty much painted on. The light up logo is also a neat touch, though it does nothing more than show off an already impressing looking device. The trackpad feels high quality and responsive, it’s one of the best button-less trackpads I’ve tested. The keyboard was less impressive, but functional. The macro button changes colour to allow for different funtions to be mapped, useful when you need settings for different games. Shadow of Mordor is one of my go-to test games. On ultra at 1080p this gave me a good average 66fps. Turn off a few details and this shoots up to 80FPS easily. GTA 5 at 1080p resolution with everything turned up came back with an unsteady 30FPS average, with FXAA and MSAA off it easily hit 60fps. At 2K I was getting playable results, though in the 40s rather than nearer 60fps, but still very playable. It was the same for Shadow of Mordor and Rise of the Tomb Raider. None of the games hit anything past 25fps on 4K, unfortunately, proving that 4K laptops do not mean 4K gaming, at least until Nvidia release some new Pascal hardware. The standard DX11 Firestrike score gave us 8180 which is quite impressive for a laptop, mainly thanks to the GTX 980M’s power. As you can see from the game scores above, though, it still doesn’t translate to 4K gaming, though at 2K you’d get some recent games to work smoothly enough. Firestrike Ultra, the 4K test, came in at 4250, still higher than expected. Heat output is a worrying factor when gaming. It started to get high when pushing this machine to its limits, though giving enough of a gap under the laptop did help and in general use the fans aren’t overly noisy until you push it too far. The more worrying concern is that the middle of the keyboard really started to heat up, too, though the trackpad didn’t get quite as hot. The 73Wh battery gives just under 2 and a half hours battery while gaming, which is far more than other gaming laptops we’ve tested. The slightly larger case helps here against Gigabyte’s thinner laptops. 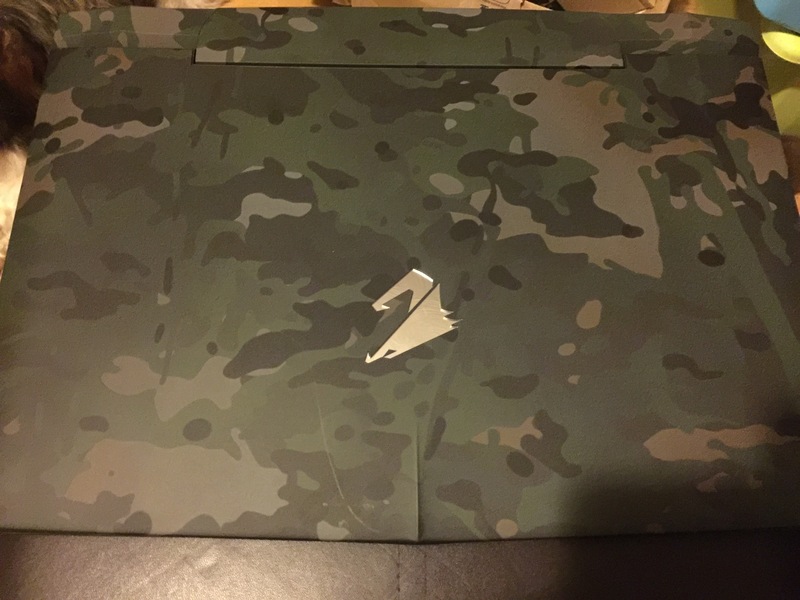 The Aorus X5sv5 Camo is a well built, great looking laptop which is perfect for those who want a fairly portable gaming device that can run all recent games. That said, the 4K screen is really for non-gaming applications as the 980M can’t cope with 4K gaming and the heat could be an issue if you plan to push this to its limits. It will, however, turn heads with its unique design and great quality screen.